Latanya Sweeney, professor of government and technology in residence, and attorney Sylvia Barrett, A.L.B. ’95, have been appointed faculty deans of Currier House (the first leaders appointed to that post since the title was changed from House master). 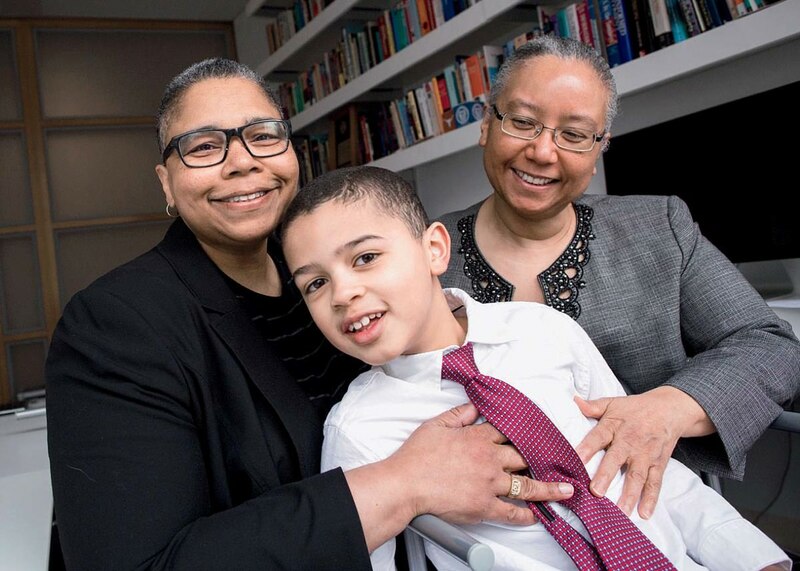 The couple, who met at MIT as undergraduates and subsequently founded a computer company together, have a son, Leonard, who is eight years old. They succeed Moore professor of biological anthropology Richard W. Wrangham and Elizabeth Ross, who stepped down after eight years of service at Currier. The Faculty of Arts and Sciences has conferred Harvard College Professorships, its highest honor for teaching excellence (a five-year honorary title, accompanied by supplementary research funding), on David Charbonneau, professor of astronomy; Marla Frederick, professor of African and African American studies and of religion; Shigehisa Kuriyama, Reischauer Institute professor of cultural history (chair of East Asian languages and civilizations, and a faculty sponsor of the Early Sciences Working Group in the history of science department); Ann Pearson, Ross professor of environmental sciences; and Salil P. Vadhan, Joseph professor of computer science and applied mathematics. The Roslyn Abramson Award for outstanding undergraduate teaching was conferred on Kirsten Weld, assistant professor of history, and Leah Whittington, assistant professor of English. The Undergraduate Council selected the following to receive its Joseph R. Levenson Memorial Teaching Prize for excellence in teaching College students: Joseph Blitzstein, professor of the practice in statistics; Roger Porter, faculty dean of Dunster House and IBM professor of business and government; and Tess Wise, teaching fellow in government. The Council’s John R. Marquand Prize for exceptional advising and counseling was awarded to James Biblarz, tutor in Eliot House; Judith Flynn, Allston Burr assistant dean in Quincy House, a lecturer on human evolutionary biology; and Susie Jang, tutor in Eliot House. And the Graduate Student Council recognized these faculty members with its Everett Mendelsohn Excellence in Mentoring Award: Jean Comaroff, Whitehead professor of African and African American studies and of anthropology; Drew Fudenberg, Abbe professor of economics; Kimberley Patton, professor of the comparative and historical study of religion; Nancy Rosenblum, Clark professor of ethics in politics and government; and Leah Somerville, assistant professor of psychology. The National Academy of Sciences has elected 84 new members, including Myles A. Brown, professor of medicine; Oliver Hart, Furer professor of economics; Hopi E. Hoekstra, professor of organismic and evolutionary biology and molecular and cellular biology (and a Harvard College Professor): Robert E. Kingston, professor of genetics; and Steven Pinker, Johnstone Family professor of psychology. The Harvard Kennedy School’s (HKS) Shorenstein Center on Media, Politics, and Public Policy has appointed Nicco Mele as director, effective July 1, succeeding Alex Jones, who stepped down in 2015. Mele, most recently at the University of Southern California, was previously deputy publisher of The Los Angeles Times and webmaster for Howard Dean’s 2004 presidential campaign (for more on Mele, see “Rise of the Little Guy”).…Black professor of political economy David T. Ellwood, a scholar of poverty and welfare and HKS dean from 2004 to 2015, has been appointed director of its Wiener Center for Social Policy. He also chairs the U.S. Partnership on Mobility from Poverty, an academic-practitioner collaboration aiming to create expanded paths for economic and social advancement. Allison professor of economics Lawrence Katz and Beren professor of economics N. Gregory Mankiw are among the 24 members of the partnership. Kenji Yoshino ’91, the Chief Justice Earl Warren professor of constitutional law at NYU, and Nicole Parent Haughey ’93, a former investment-research and corporate executive, have been elected president of the Board of Overseers and vice chair of the Overseers executive committee, respectively, for the 2016-2017 academic year. Jane L. Mendillo, president and chief executive officer of Harvard Management Company from 2008 through 2014, has been nominated for election to the board of directors of General Motors Company. She is already a director of Lazard Ltd., the investment bank, and a trustee of the Andrew W. Mellon Foundation.…The Radcliffe Institute’s 55 fellows during the 2016-2017 academic year include a bumper crop of 11 Harvard affiliates, ranging from Tomiko Brown-Nagin, Paul professor of constitutional law and professor of history (who is working on a biography of Constance Baker Motley) to Eugene Wang, Rockefeller professor of Asian Art (Chinese art). See the complete list at www.radcliffe.harvard.edu/news/press-releases/from-around-the-world-and-across-harvard.